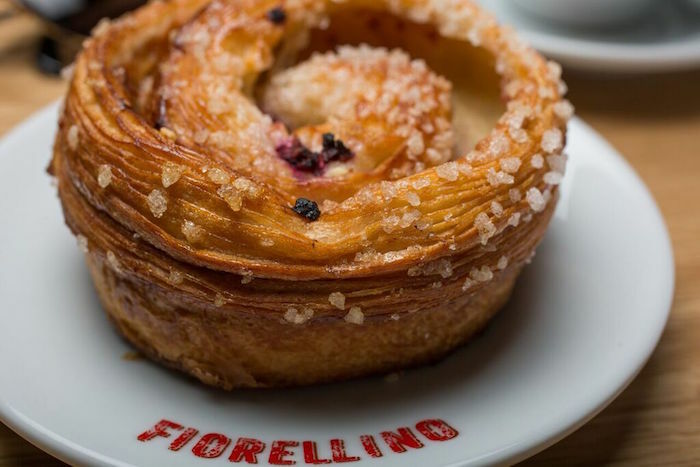 We find Fiorellino on a quiet section of La Gauchetière near Beaver Hall where the longstanding structures of Old Montreal meets the sky-scraping new towers of downtown. 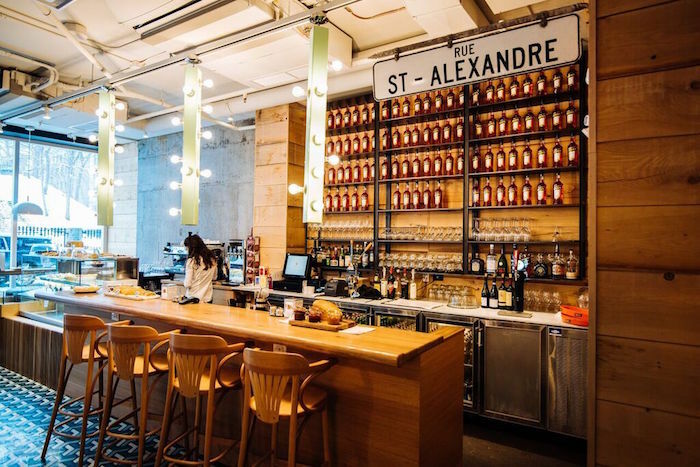 In the few short weeks it has been open, Fiorellino, a new Italian snack-bar from the guys behind some of Montreal’s coolest restaurants, has been attracting a wealth of attention from hungry Italian food lovers. A little nasty winter weather is nothing compared to a Montrealer’s desire to head out for a night on the town. Last week, the owners of Fiorellino (“little flower” in Italian) invited a few members of the media to share a couple of tables and a selection of dishes from their menu. Mother Nature had spent the day throwing every nasty bit of weather imaginable at us. From snow to freezing rain, it was enough to discourage the most devout nightlife lovers but in Montreal we take winter in stride. 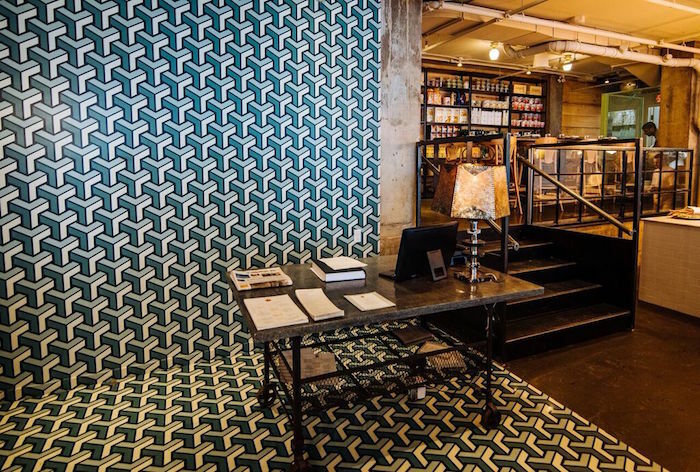 The restaurant was buzzing with busy tables dotted throughout the space and although we were a little disheveled, we showed up, eager to get a taste of the restaurant. One of the owners, Massimo Lecas, was on hand to greet us as we kicked the evening off with refreshing Apersol Spritz (this will be the cocktail of choice this summer!) and a selection of delicious pizzas. Along with his partners, Lino Lozza, Angelo Leone and Robbie Pesut, Massimo has been behind some of Montreal’s most success nightlife hotspots. 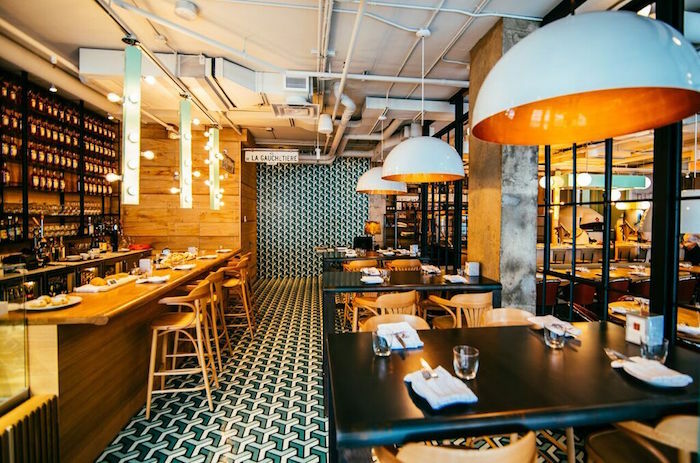 From the now defunct Globe and Magenta to current heavy-hitters like Rosalie and Buonanotte in Montreal and Toronto, they each bring over 25 years in the restaurant business to Fiorellino. While we mingled near the bar with our cocktails, the kitchen sent over selection of exquisite pizzas to get our taste buds ready for the night. 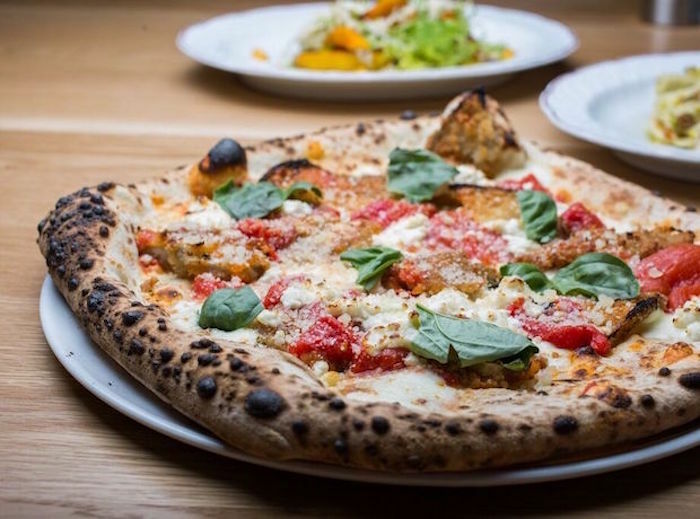 From their wood-fired oven we sampled the Marinara (tomato sauce), the Soppressata Picante (spicy soppressata, fiore de latte) and the Tutta Vestita (roasted red peppers, confit mushrooms and spicy soppressata). The key to a great pizza is a great crust and Fiorellino has one of the best I’ve ever tasted in the city. Baked to perfection with bubbles of hot air escaping the cracked blisters on the exposed crust, each pizza was topped with tangy red tomato sauce and fresh, mouthwatering ingredients. Moving to our tables, we settled in for a five course rollercoaster ride of delight. The restaurant set up a special tasting menu and wine pairing for the media event. I won’t be coy, I loved every single bite I tasted and as you read, you will see why. Each course was introduced by Fiorellino’s chef, Erik Mandracchia whose past experience includes la Caban de Pied de Cochon, Impasto and le Bremner. We started things of with Insalata di Funghi Crudi (Mushroom salad) from the antipasti menu. If they their goal was to impress right out the gate, they hit the bullseye with this dish. The thinly sliced oyster mushrooms had an al dente pasta texture that was complimented by parmesan cheese and gremolata (lemon zest, parsley, garlic). It was not what I was expecting from a mushroom dish. The next dish to arrive was the Insalata di Polpo (octopus). At this point I can no longer say that I don’t eat seafood. At every turn I seem to be sampling exotic fish, shellfish and other wonderful dishes that a few years ago I wouldn’t have given a second thought. If the first dish was meant to impress, this dish, again from the antipasti menu, was mean to solidify our faith in Fiorellino. The octopus was lightly fried and perfectly cooked. Accompanied by small potato rounds, onions, capers, fennel and herbs, it was one of my favourite dishes of the evening. Gnocchi is one of Italy’s greatest gifts to the world. Massimo’s father makes all of Buonanotte’s gnocchi by hand but at Fiorellino the recipe is a little different. Instead of using potato, their gnocchi is hand-made almost entirely from ricotta and a pinch of flour. 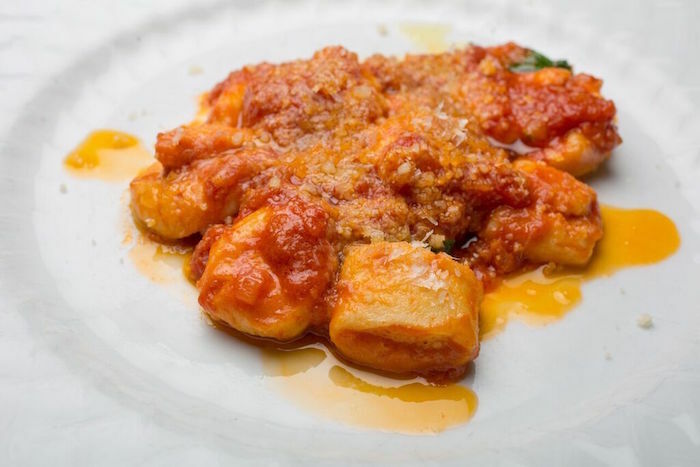 It was our third dish of the evening and the result was a fluffy, cloud of ricotta gnocchi covered in a wonderful pomodoro sauce that melts in your mouth. The last main course dish on the tasting menu was a succulent rack of lamb served with eggplant, yoghurt and onions. The yogurt gave the dish a curious greek flavour while the lamb was cooked to perfection; pink towards the centre and lightly herb-crusted on the outside. 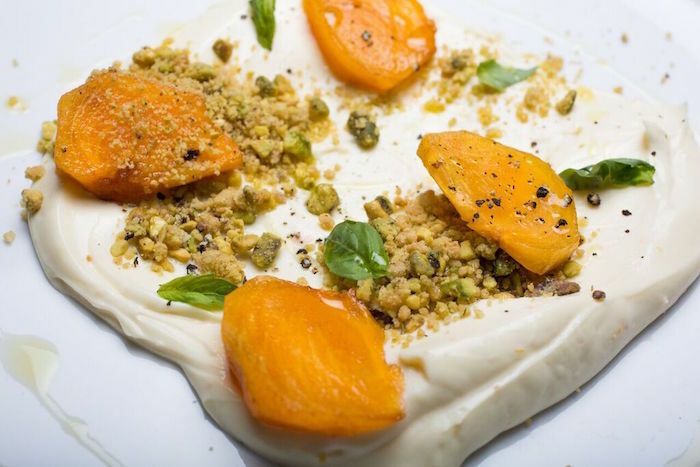 The dessert at the end was a simple yet refreshing ricotta pudding with fresh fruit, pistachio crumble and a drizzling of EVOO. After a varied and vast selection of delicious food, it was nice to end them meal on a lightly sweetened note. Capping the night off we were offered a selection of Italian digestives including Averna, Vecchio Amaro del Capo and Montenegro. Italian food is some of the richest, most delicious food in the world. 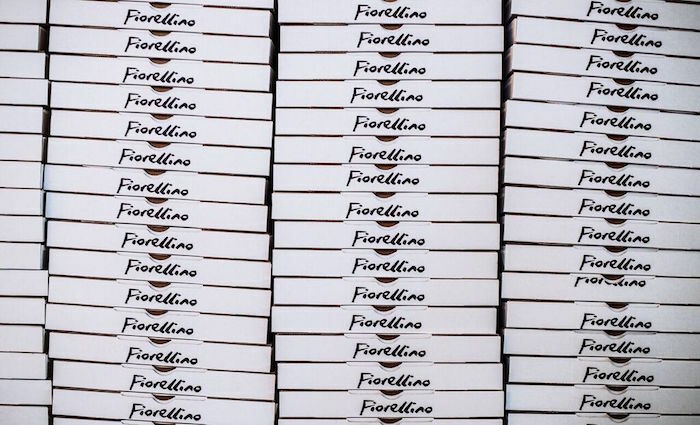 Fiorellino’s approach to simple yet wonderful, shareable food is a nod to the culture’s well known attitude that there’s always a place at the table for one more as there’s lots to go around. Open from 7am on weekdays, the restaurant also offers fresh pastries and Italian coffee for those who’d rather skip the run of the mill coffee chains. 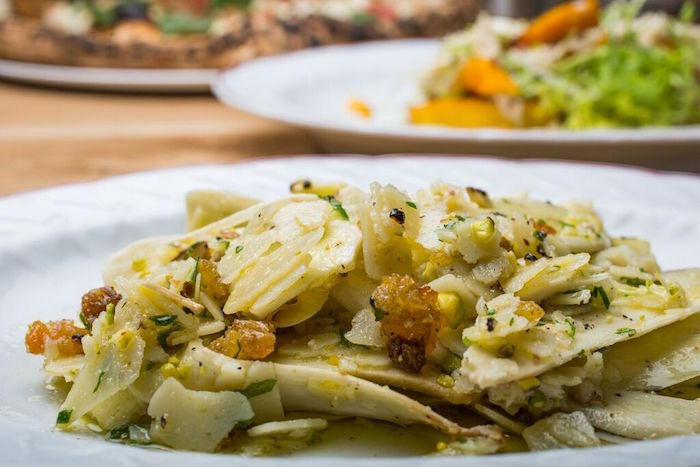 In a city like Montreal, where Italian food is well represented, Fiorellino isn’t just taking its place at the table, its bring something delicious for us all to enjoy.